Are you looking for a team-building event that is out of the ordinary, empowering and uplifting? Have you considered having a weekly fitness activity that helps boost morale around the office? 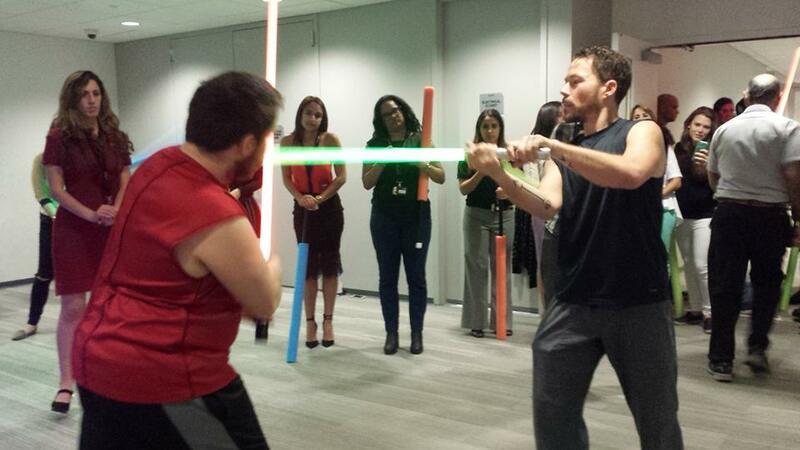 Consider having an LED saber battle in your office or the park across the way. SaberCraft provides group training with challenges for teams to overcome. Why do a bowling outing? Salsa classes? Cooking classes? All of these are so 1984. Consider bringing something out of this world to your crew as they learn the basics of LED saber fundamentals. We then pair team members together so they learn to work together. We incorporate music to create an immersive experience that transforms whatever corporate event you are having into a employee-bonding experience that your employees will talk about in the years to come. SaberCraft offers private-group corporate events that fits with your employee work-days schedule. Sense of empowerment – The limited physical activity we do encourages 2 or more people to work together to build a routine that makes them feel fast and furious! Sense of wonderment – The LED saber will have your team talking about “swinging sabers” to families and friends. They will leave photos that will leave their kids and friends speechless. Well-being – we open and close the workshop with stillness of the mind to calm anxieties and fears. The light activity has folks on their feet for an hour and burning anywhere from 50 – 10 calories a session. Camaraderie – there are group exercises that have members engage each other building the sense of “team-building”. Loyalty – As the company that brings this new activity into their lives, your company will be seen as very unique. We guarantee your employees have never experienced this and may never have a chance to. Interested in knowing our rates and booking some time, give us a call at 786-315-9133 or contact us using the form below.